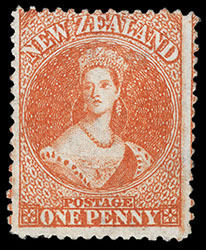 New Zealand, 1862, Queen Victoria "Chalon Head", 1d orange vermilion, perf 13, Large Star watermark, unused without gum, rich vibrant color on bright fresh paper, F.-V.F. and scarce unused example. Scott No. 16a. Campbell Paterson No. A1f (1). SG No. 68 £3,250 ($4,270). 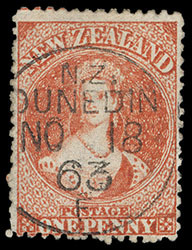 New Zealand, 1862, Queen Victoria "Chalon Head", 1d orange vermilion, perf 13, Large Star watermark, well centered with strong color, cancelled by neat socked-on-the-nose "N.Z., Dunedin, NO 18, 63" cds, Very Fine. Scott No. 16a. Campbell Paterson No. A1f (1). SG No. 68 £350 ($460). 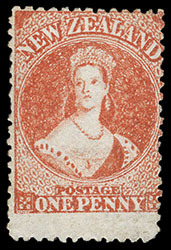 New Zealand, 1862, Queen Victoria "Chalon Head", 1d carmine vermilion, perf 13, Large Star watermark, unused without gum, well centered with tight margins, intense radiant color, fresh and Very Fine, a beautiful unused example of this desirable shade. Scott No. 16. Campbell Paterson No. A1f (2). SG No. 69 £3,250 ($4,270). 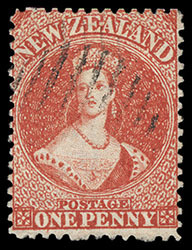 New Zealand, 1862, Queen Victoria "Chalon Head", 1d vermilion, perf 13, Large Star watermark, unused without gum, close margins except huge bottom margin, deep vibrant color, fresh and Very Fine, a rare unused stamp; with 1977 R.P.S.N.Z. certificate as carmine vermilion. Scott No. 16 var. Campbell Paterson No. A1f (3). SG No. 69 var. £3,250 as carmine vermilion ($4,270). 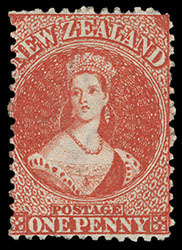 New Zealand, 1862, Queen Victoria "Chalon Head", 1d carmine vermilion, perf 13, Large Star watermark, nicely centered with brilliant color on bright paper, lightly cancelled by partial barred oval, particularly fresh and Very Fine, Chalon, Christie's Robson Lowe, February 1989, lot 249. Scott No. 16. Campbell Paterson No. A1f (2). SG No. 69 £350 ($460). 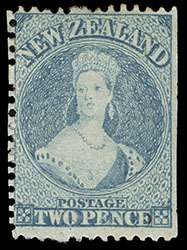 New Zealand, 1862, Queen Victoria "Chalon Head", 2d greenish slate blue, perf 13, Large Star watermark, rich color, cancelled by "Dunedin" in bars, Very Fine and rare, Joseph Hackmey, Spink Shreves, May 2010, lot 2249; with 1980 R.P.S.N.Z. certificate. Scott No. 17b var. Campbell Paterson No. A2e(2) var. SG No. 71 var. £750 as normal ($980). 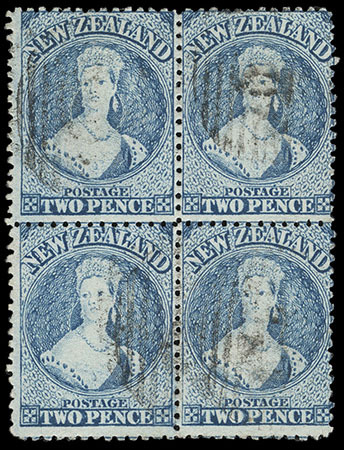 AN EXCEPTIONALLY RARE SOUND EXAMPLE OF THIS DISTINCTIVE SHADE VARIETY, THE RAREST OF THE 2D PRINTINGS. 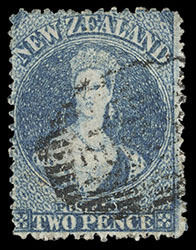 New Zealand, 1862, Queen Victoria "Chalon Head", 2d blue, perf 13, Large Star watermark, unused without gum, well centered with rich color on bright paper, two small tears at top, otherwise fresh and Very Fine appearance; with 2014 Odenweller certificate. Scott No. 17. Campbell Paterson No. A2e(7). SG No. 72 £750 ($980). Joseph Hackmey, Spink Shreves, February 2009, lot 1256; signed Holcombe, with 2007 R.P.S.L. certificate. Scott No. 17. Campbell Paterson No. A2e (7). SG No. 72 Estimate $500 - 750. 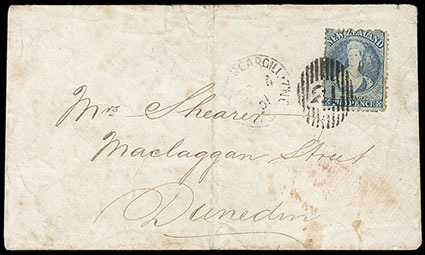 New Zealand, 1862, Queen Victoria "Chalon Head", 2d blue, perf 13, Large Star watermark, tied by bold "21" vertical barred oval duplexed with partial "Invercargill, OC 4, 64" cds to Dunedin, red (10.7) arrival backstamp, reverse with all-over blue Pickford & Co. General Carriers ad showing horse drawn covered carriage; cover wear and faults, Fine and rare illustrated ad cover. Scott No. 17. Campbell Paterson No. A2e (7). SG No. 72 Estimate $300 - 400. 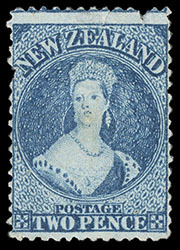 New Zealand, 1862, Queen Victoria "Chalon Head", 2d milky blue, perf 13, Large Star watermark, regummed, well centered, s.e. 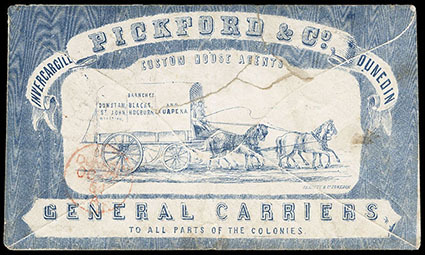 at right, pretty pastel color on bright paper, filled thin, F.-V.F. and exceedingly rare unused example unpriced in Gibbons; with 2014 Odenweller certificate. Scott No. 17c. Campbell Paterson No. A2e (4) $4,000 ($2,740). SG No. 72a Estimate $300 - 400.